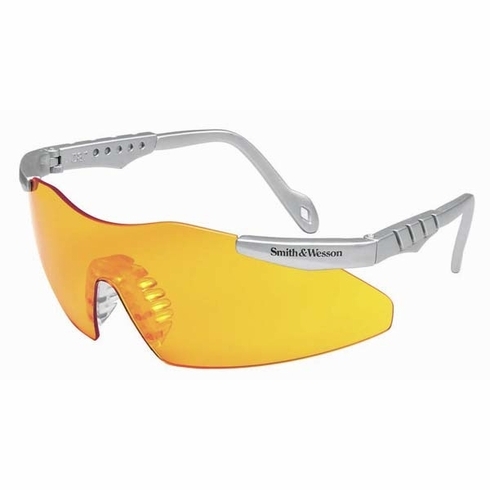 Smith & Wesson, Safety Glasses, Magnum Elite Platinum Frame, Orange LensSmith & Wesson, Safety Glasses, Magnum Elite Platinum Frame, Orange Lens, Item # SW153O-RI, Legendary Smith & Wesson name insures worker acceptance. Precision cut to shape 7 base spherical lens for increased distortion-free peripheral protection. Legendary Smith & Wesson name insures worker acceptance. Precision cut to shape 7 base spherical lens for increased distortion-free peripheral protection. Maximum UV protection. Adjustable temples with four settings for a precise fit. Ribbed, non-slip rubber nose piece for all day comfort. Exceeds ANSI Z87.1 performance standards.